Answer Racing began addressing questions in 1976 on what motocross products riders could trust. 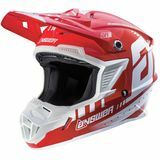 Today, Answer manufactures a full line of motocross gear, bags, protection and helmets. Answer helmets solve every rider's quest in finding quality head protection at a moderate price. The Comet and Evolve series represent higher-end line of Answer helmets coming in well under $200 featuring Snell and DOT approvals, a new injection-molded polycarbonate shell and multiple intake and exhaust vents for optimum cooling. The Nova series is a solid DOT approved helmet with multiple cooling vents for under $100. Answer helmets are available in women's and youth sizes too. 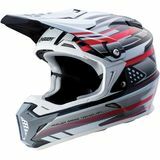 MotoSport is the best place to buy Answer helmets. We have a 90-day return policy. Use the size charts to help you take the guess work out of selecting your product. If your Answer helmet doesn't fit, our hassle free return policy means we make it easy for you to get the right one.